Wow! 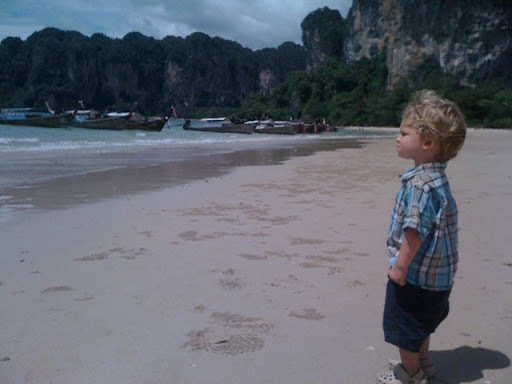 That really sums up our beach in Railay Bay, just southwest of Krabi in Thailand. Known as a world-class hotspot for rock climbers, we're very lucky to get to spend the next four days here at Railay Bay Resort and Spa. Our buddy Kwon drove us down from our mountain resort to Au Lang, where we proceded to board a longtail boat with a few other brave people. Luckily, Rachel hurriedly got Jackson's lifejacket on just in time, as water poured in to the back of the boat, while the captain steered the rustic old thing with his inner thighs over fairly bumpy waters. The ride was short, and when reached shore 15 minutes later, we piled onto a short stretch of white-sand beach nestled between sky-high karst formations and aqua-blue warm waters. Our cottage is back off the beach and is basically it's own little property, with an outdoor cold sauna/tub, a patio and yard with a fish pool, and a lot of luxeries that are down-right ridiculous for the $69 per night we paid through a Web deal yesterday (it's definitely smart to wing vacation plans in Thailand rather than to book far in advance). The sunset tonight was truly as psychedelic as all the guidebooks say. (I'll post a picure or two here over the next few days.) The tropical drinks are appropriately strong. The red curry was surprisingly spicy for resort fare (very thankfully). And the place's two huge pools are perfect to both keep Jackson occupied and to wear him out so he gets long nights of sleep.